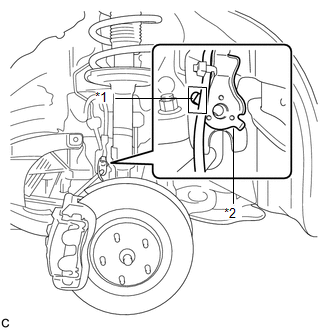 If the sensor rotor needs to be replaced, replace it together with the front drive shaft assembly. 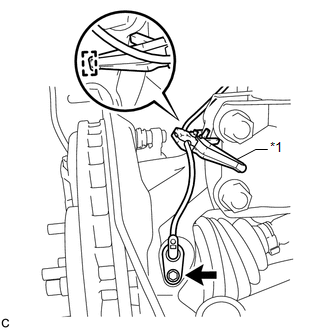 (a) Install the resin clamp and front speed sensor with the bolt. Firmly insert the front speed sensor body into the knuckle before tightening the bolt. After installing the front speed sensor to the knuckle, make sure that there is no clearance between the front speed sensor stay and knuckle. Also make sure that no foreign matter is stuck between the parts. Before installing the clamp, firmly insert the points of the clamp into the installation holes. (b) Temporarily install the No. 1 sensor clamp. Be sure to insert the No. 1 sensor clamp claw into the stopper hole while installing the No. 1 sensor clamp. 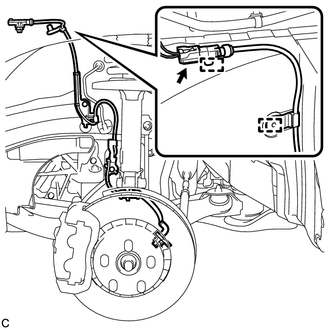 (c) Install the front brake flexible hose and No. 1 sensor clamp together to the shock absorber with the bolt. Do not twist the wire harness for the front speed sensor when installing it. 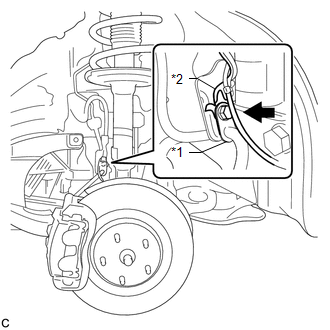 A bolt tightens the brake flexible hose and front speed sensor together. 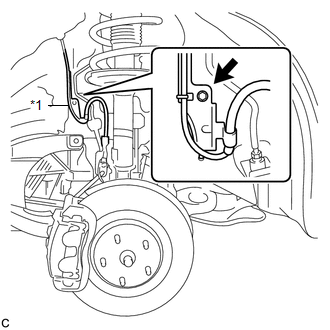 Make sure that the flexible hose is positioned over the front speed sensor. (d) Install the No. 2 sensor clamp to the body with the bolt. (e) Install the 2 clamps and connect the front speed sensor connector.